Now available in my Etsy shop Paper Gumbo. 1 cotton linen canvas tea towel, measuring about 15.5 inches x 24.5 inches. My watercolor butterfly illustration is printed on a white background with Louisiana French language in a dark brown color. The fabric is beautiful, looks like 100% linen. 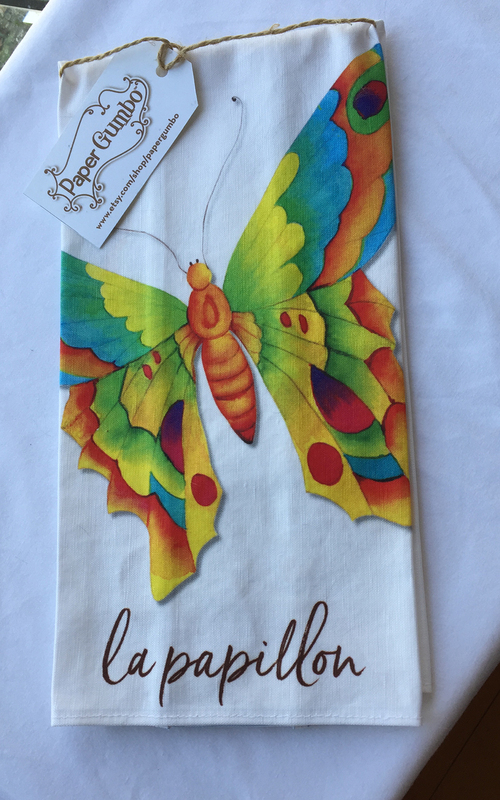 The printing on this dish towel is bright and vibrant-a true representation of the original painting. Washable in warm or cold water with a phosphate free cleanser. Dry low or line-dry. Iron on the back of print if necessary on medium setting. Fabric has been pre-washed but may still shrink slightly. Makes a great gift. This tea towel will brighten up any kitchen as a decorative accessory. This item is printed, stitched and ready to ship.